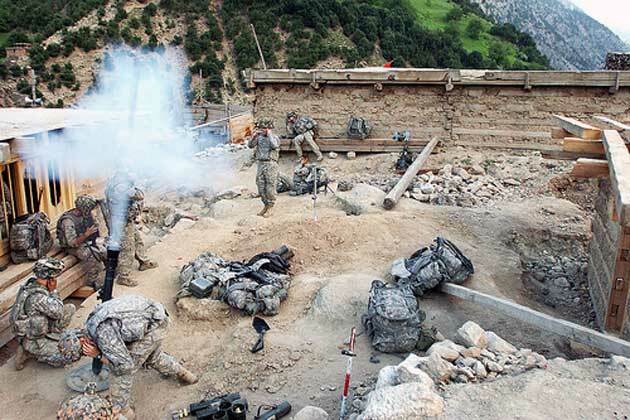 U.S. Army soldiers fire mortar rounds at suspected Taliban fighting positions during Operation Mountain Fire in Barge Matal, a village in eastern Nuristan province, Afghanistan, July 12, 2009. U.S. and Afghan forces secured the remote mountain village, which was overwhelmed by insurgent forces several days before. The U.S. soldiers are assigned to the 10th Mountain Division’s 1st Battalion, 32nd Infantry Regiment. U.S. Army photo by Sgt. Matthew C. Moeller.